Burlington House, Townwall Street, once stood like an obscene gesture to those using the A20 going to the Eastern Docks. Almost from the outset Dover folks argued for its demolition but beyond vague promises and even vaguer excuses, the building stood. 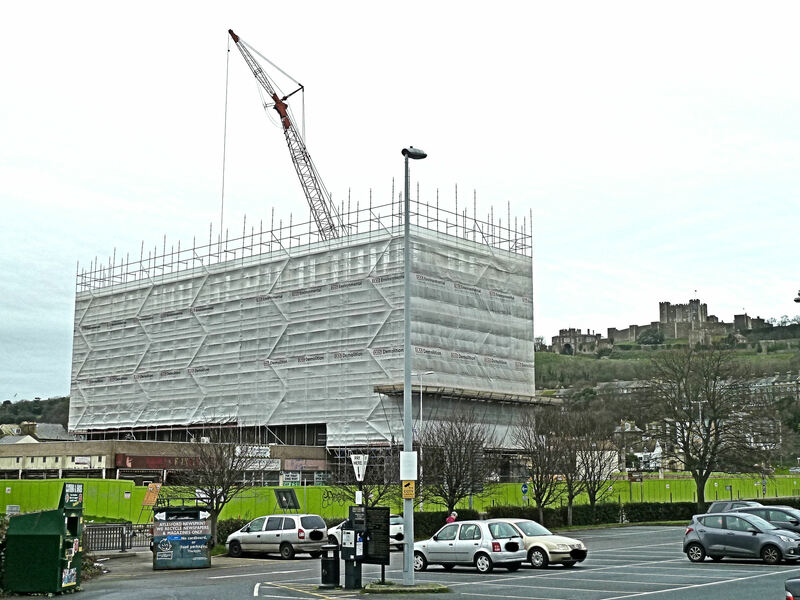 In my own archives, I have filed the documents and cuttings relating to the building under ‘Historic Buildings,’ for, in my opinion, it was a monument to Dover’s self-perpetuating arrogant elite. Particularly after I was publicly chastised for suggesting that it should be demolished! Townwall Street circa 1930s, the narrow road left of the broad Liverpool Street running parallel to the seafront. Courtesy of David G Atwood. Townwall Street evolved following the building of the Dover town walls in the 14th century and up to the outbreak of World War II (1939-1945) was a thriving thoroughfare within a densely populated area of Dover. In those days, going eastwards, the street merged into Clarence Street before reaching Woolcomber Street. 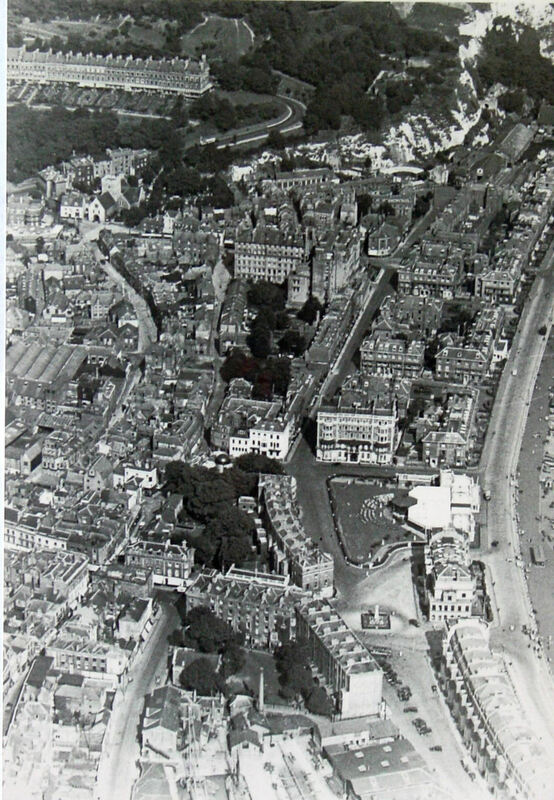 There, on the south side was the iconic Burlington Hotel, a prominent landmark that, unfortunately, became the sight mark for German gunners across the Channel as well as bombers dropping their load on the town. On Sunday, 7 September 1941, a Junken dive-bomber dumped its load leaving the hotel a ruin. Following the war, the decimated building was bought by Dover Corporation who demolished it in 1949 but a later council gave the name to their iconic building – Burlington House. Following the war, the council’s vision for the battered town was to turn it into the ‘vanguard town of the future.’ They drew up plans that were incorporated in the Abercrombie Report and when materials became available, in the name of concrete and glass modernisation, beautiful and historic buildings were demolished. Crucial to this philosophy was an icon that would epitomise, to Europeans crossing the Channel, that Dover represented a country that was prepared to shut the door on the past preferring modernism and forward thinking. The landward side and eastwards of Townwall Street, at that time was a huge bombsite. 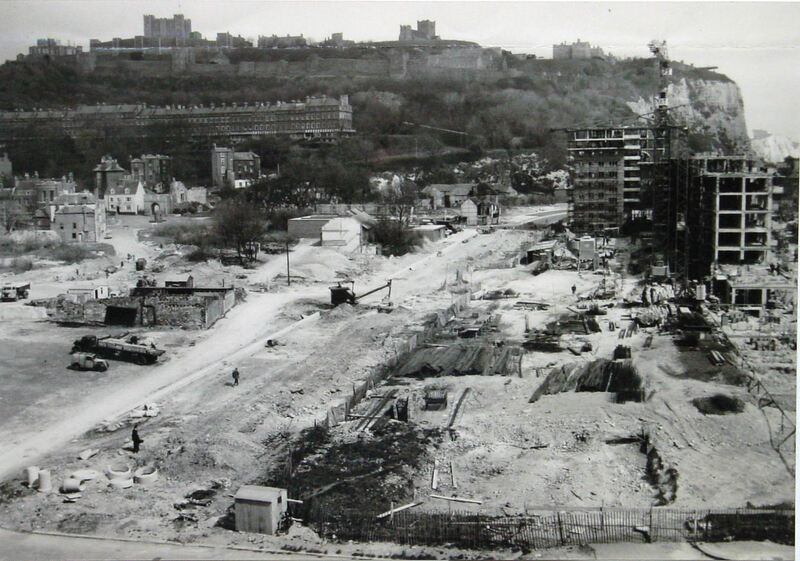 It was on this bombsite, closer to the sea, that the 221 Gateway flats were completed in 1960. To the west of the flats the iconic ultra-modern Dover Stage Coachotel was built. It opened in May 1957 but was demolished in 1988 to make for a car park for the ill-fated White Cliffs Experience. Back in the 1950s, for the Townwall Street site, the council wanted a ‘futuristic showpiece high class development’ that would ‘encourage more people to stay at the gateway of England without simply passing through.’ Although they owned the land at that time, the council did not have the money or have anyway of raising money, to create the ambitious edifice they had in mind. A saviour arrived in 1961 when Regents Park Land Company came along with a £600,000 project to build a 20-storey block of 100 high-class flats with a piazza surrounded by a two-storey podium containing shops. The plan included a bridge over Townwall Street and the consultant architect was Arthur Keyon. He had judged the competition that produced the winning design for the Gateway Flats. The company bought the site for £40,000 but the project fell through and the council bought it back three years later for £30,000, making £10,000 profit not counting interest! 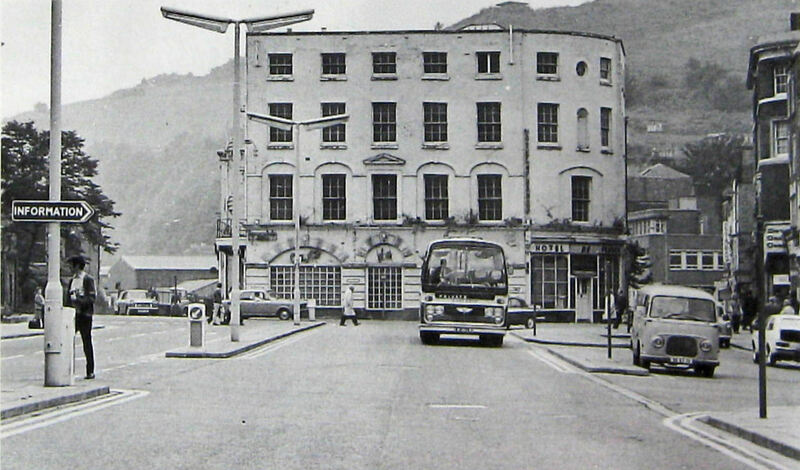 In 1968, the Corporation, in conjunction with Rank City Wall and Miller Brothers & Buckley Development, announced that, ‘the last and most important part of our post-war rebuilding programme. 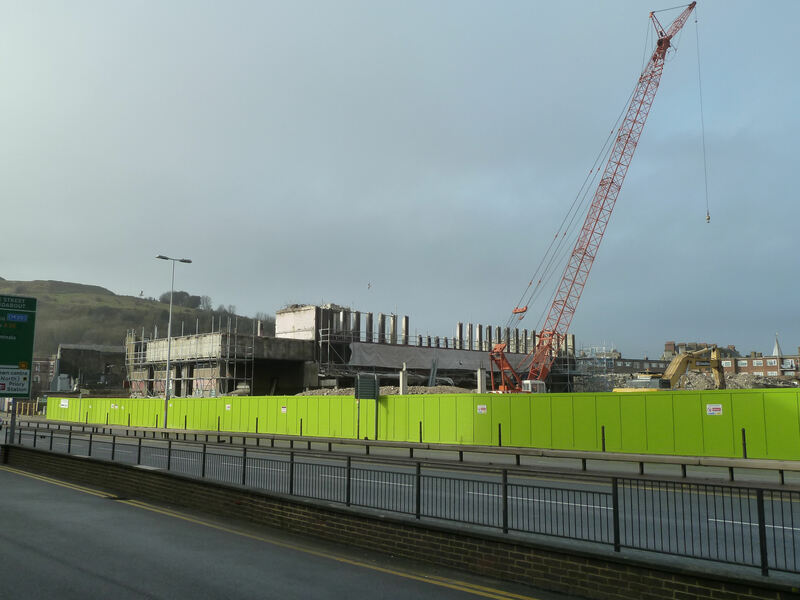 The last piece of jigsaw and the beginning of a new Dover,’ was to be built on the site. The council would retain the freehold and it was expected that ratepayers would also benefit from the rents paid on head-leases. The cost of the proposal to the developer was estimated as £1.5million. The complex envisaged, revolved around a 23-storey office block and a 144 double-room hotel operated by Eurotels Ltd. The office block would also have a pent-house restaurant capped by an observation roof garden. There would be a conference hall for 650 people, showrooms, shops, and a multi-storey car park for 500 cars. Access to the East Kent Road Car Company bus garage on St James Street need to be retained, so the design included bridging the road. The river Dour would be a feature and the whole complex was expected to provide 600 permanent jobs. In the end, KCC agreed to the plan as long as the office block was reduced to 21-storeys. However, the Royal Fine Arts Commission objected to both the height of the office block and the ugliness of the overall design. Nonetheless, in 1970, the government gave its permission as long as the office block was reduced to the 12-storeys we see today. The hotel capacity was reduced to 83 double-rooms. During the planning process, the multi-storey car park was treated as a separate issue and given permission. The St James Lane multi-story car park, as it was called, had 420-spaces and that pushed the cost of the overall complex up to £2m. The developers therefore dropped the conference hall, showrooms and the shops from the design and building work started. Officially, the complex came into operation in June 1972 but it was not for another year that Holiday Inn took over the 125-year lease for the hotel. Offering a swimming pool, in-house movies, air conditioning and food service 16-hours a day and the hotel was a reasonable success from the outset. When East Kent Road Car Company bus garage in St James Street was built, the access and egress was no problem, but with the building of Burlington House and the adjacent Holiday Inn, these became a problem. The photograph was taken from Russell Street looking west. The back of Holiday Inn on Townwall Street and facing the sea, was on the left. Burlington House ahead shows the arch over St James Street that led out to the one way King Street. 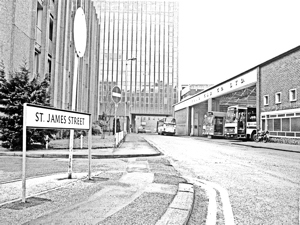 Buses on leaving the garage would turn left on to St James Street and then right onto the one way Russell Street. On arrival they would leave Townwall Street turn into Mill Lane and then left again into St James Street as can be seen by the coach in the photograph. On leaving the bus station they would turn left onto St James Street and then onto the one way Russell Street that would take them to Townwall Street. 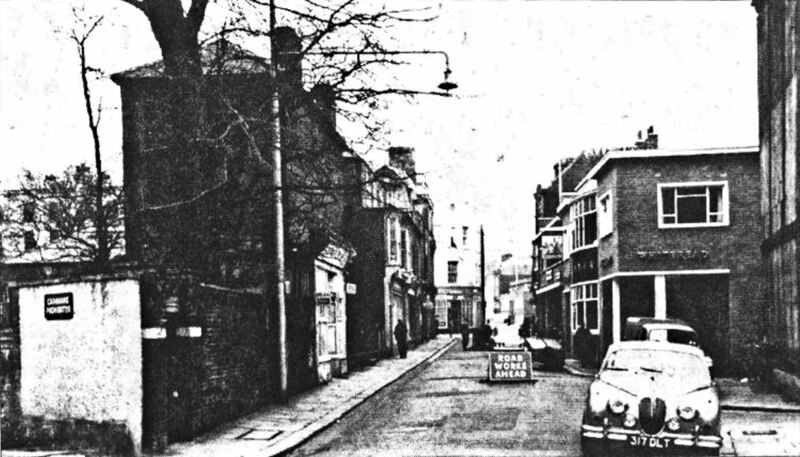 At that time they could turn right into St James Street and go through Market square, and up Biggin Street. However, but to the one way system, if the bus was going any where else, from King Street it would have to turn right on to the then ancient and narrow Dolphin Lane – at the back of the bus garage – from where they could reach the one way Russell Street. They would again turn right until they reached the two way Townwall Street. The multi-storey car park, on the other hand, failed to attract customers as it was difficult to find by those who did not know Dover’s road network. It was also relatively expensive compared to other car parks in the town. Even though there had been extensive advertising for the 80,000 metres of office space in Burlington House, as the tower block was called, it failed to attract any customers. On 1 April 1974, Dover District Council (DDC) took over from the individual Dover, Deal and Sandwich councils as well as the Rural council and thus their approximately 1,000 staff were housed in 15 different locations throughout the new District. Burlington House was completed that year but was still empty and many felt that it should be leased by DDC for their headquarters. Indeed, KCC agreed, in principal, to share the office block agreeing to pay the developers’ asking price of £2 a square foot plus 25pence for air conditioning. However, following a meeting that lasted nearly five hours, the move was rejected by the majority DDC Conservative councillors as they wanted a centralised office block in the council’s ownership. The Labour members agreed but argued to use Burlington House in the interim. Dover’s Mayor, Councillor Peter Mee, and seasoned Councillor Kathleen Goodfellow, both resigned from the sub-committee looking into DDC office accommodation. In February 1975, the multi-storey car park was suddenly closed by the Car Parking Management and was later repossessed by DDC. The hotel changed hands from Holiday Inn to Dover Moat House Hotel in 1985 and then County Hotel. In the council owned Burlington House, floors were available for rent for office use. Customs and Excise along with Freight Forwarders, a bank’s administrative office and a government-training centre moved in, but most remained empty. Townsend Thorensen Ferries – later P&O – moved their Catering, Marine Accounts and Group Bookings in, taking up the 8th and 9th floor. During this time, I was assigned a shared office in Burlington House but it was far from ideal. Along each floor is a central corridor running north – south with offices on each side. Because of the design, the windows of the offices face east or west. In the morning, on sunny days, the east offices are considerably warmer than the west and visa-versa in the afternoon. The central heating, which was ubiquitous to all offices, did not take account of this. Loos were in blocks, with male loos on one floor and female on the alternate floor – our floor was designated for men. Finally, even if the block had been half utilised, the lift capacity would have been inadequate. 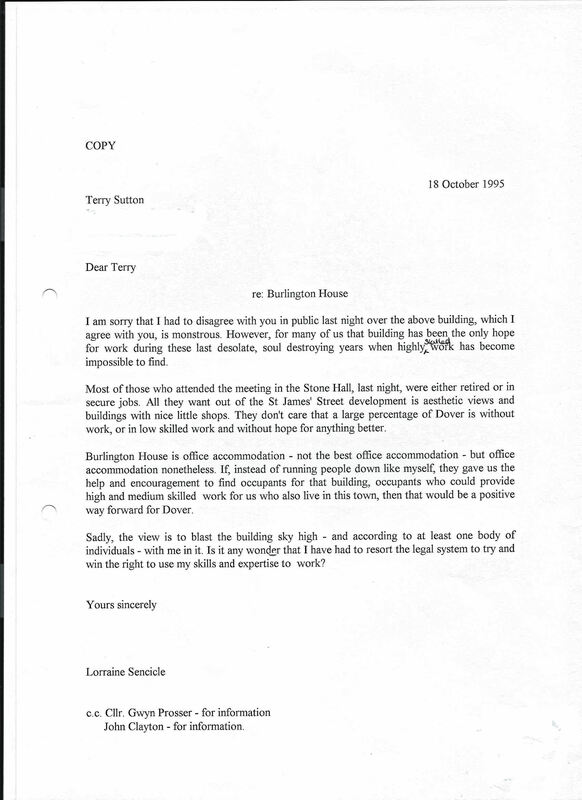 By 1990, Towerstates Ltd held the head-lease of Burlington House and floors were let to the Customs, NatWest Bank and the Job Club for the unemployed, the rest remained empty. Concern was expressed by DDC that essential repair work had not been carried out and a Dilapidation Order was issued. Early in 1993, Oaklea Properties bought the head-lease from Towerstates and they were particularly concerned about the ugly plant-room at the top of the building. When planning permission was first given ‘plant room’ was assumed to be a nursery for the roof garden not for the lift mechanism/electronics and other utility purposes! The new lessees wanted to hide the mistake over the word ‘plant’ with an advertisement hoarding that could be seen from the sea. DDC responded by demanding improvements to the structure listed in the Dilapidation order, emphasising that dealing with roof and window leakage should be given priority. The following year Oaklea Properties sought planning permission to convert the upper nine storeys into residential use. 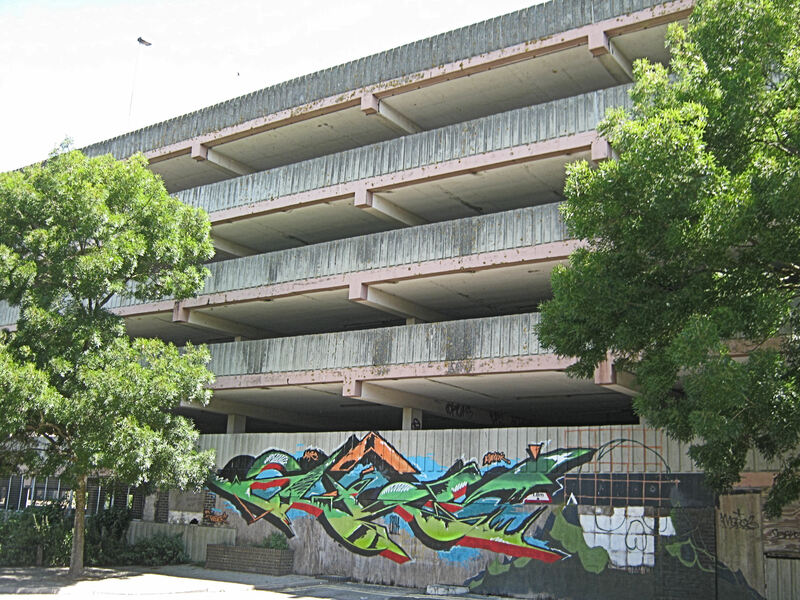 They also asked for 108 spaces of the now 297-space St James Street car park for residential use. The proposal fell through but the Property Company occasionally managed to let offices out to freight forwarding agents and leased space on the roof for telecommunication equipment. Planning permission for the latter was first given in 1995 and proved to be lucrative. On 22 September 1993, DDC Land Committee received a presentation by John De Stefano Company Ltd, the managing agents for Oaklea, in respect of proposals for enhancement of the exterior of the buildings. The committee made it clear that the pressing concern was for repairs to parts of the structure in accordance with the Dilapidation order. Two years later saw another application for part of the building to be converted into residential use. 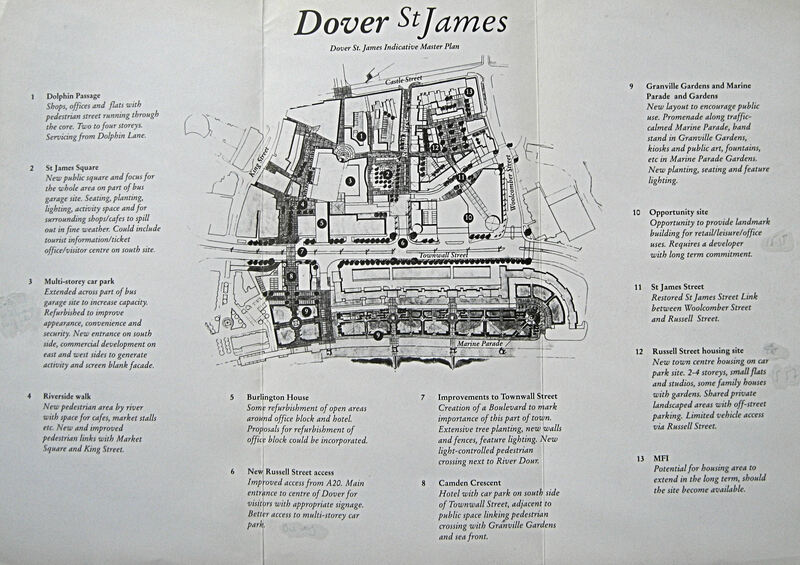 In 1995, the St James area re-development programme was launched by DDC under the heading ‘Indicative Master plan for a new future,‘ (later the Dover Town Investment Zone – DTIZ). The council had commissioned a study of the area between Townwall Street and Castle Street, which they recognised, presented a negative image. The study was presented in Connaught Hall, Maison Dieu (former Town Hall) on 17 October that year. I was one of those who attended. There, Steve Bee, of planning consultants Llewelyn-Davies, gave an over-view of the master plan that included the demolition of the MFI building on Woolcomber Street – that did happen. Albeit, Burlington House was only given a cursory mentioned saying that some refurbishment would take place. Some in the audience took a different stance, loudly proclaiming that the building should be demolished! They were led by Terry Sutton, of the Dover Express, who was at the meeting representing the Dover Society. There were others in that audience, including myself, who although deplored the building and could see their logic, did not altogether agree. At that time Dover’s unemployment rate was sky-high with many highly skilled folk on the scrap heap. We saw the building’s potential for providing much needed skilled jobs and I stood up and said so. Much of what I said was reiterated in a letter to Mr Sutton later (see left). Following that meeting, the council opted for a pragmatic approach and did nothing. By the Millennium Burlington House was declared unfit for occupation and not economical to repair. 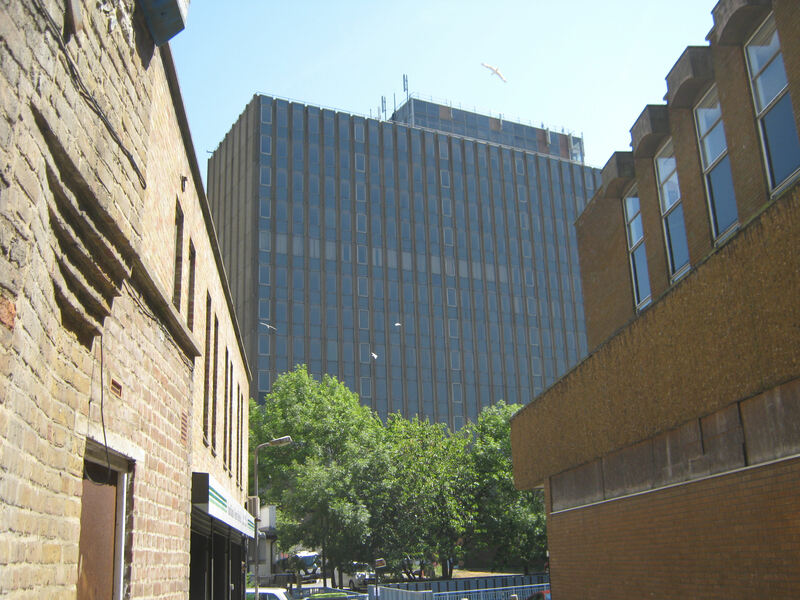 By that time the St James area re-development programme, which was still on the drawing board, contained the proposal to demolish the office block. That year the building was removed from the business rates list by the Valuation Office because it was unfit for occupation. The building was still leased to Oaklea Properties and the roof was rented to various companies who covered it with telecommunication aerials. Two-years later overt public concern was centred on the safety of Burlington House has parts of the structure were falling off. A DDC’s spokesperson comment was that Burlington House was ‘included within an area ear-marked for development in the Dover Town Investment Zone (DTIZ), for which the council has invited development proposals.’ On reading this, I wrote a letter that was published in both local papers outlining the above history of the building and calling it a ‘monument to bad planning.’ This immediately provoked a backlash from former councillors and senior council employees! In 2005, Burlington House featured in TV’s Channel 4’s Demolition programme, as one of Britain’s most hated buildings. 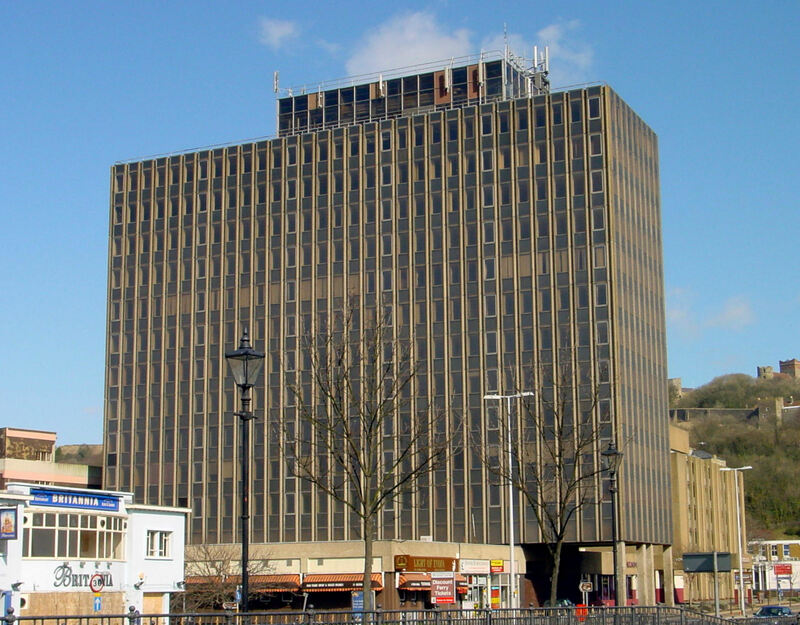 The presenter, Kevin McCloud, came to Dover and he described the building as a ‘dirty, dusty, stunted skyscraper.’ The cost of demolition was given at the time as £2m but the importance of its height that made it ideal for the telecommunication aerials on the roof was given as the major obstacle. Planning permission was sort, in 2007, for temporary consent to erect display advertisement hoardings on the Burlington House. The application stated that it was intended to cover the four sides of the building with clean building wrap incorporating two areas, east and west, for the display areas. It was expected that the displays would be changed regularly and glare kept to a minimum. Justification was based on the DDC ‘Dover Pride’ initiative that included a campaign to encourage entrepreneurship. The grand advert proposal was rejected. 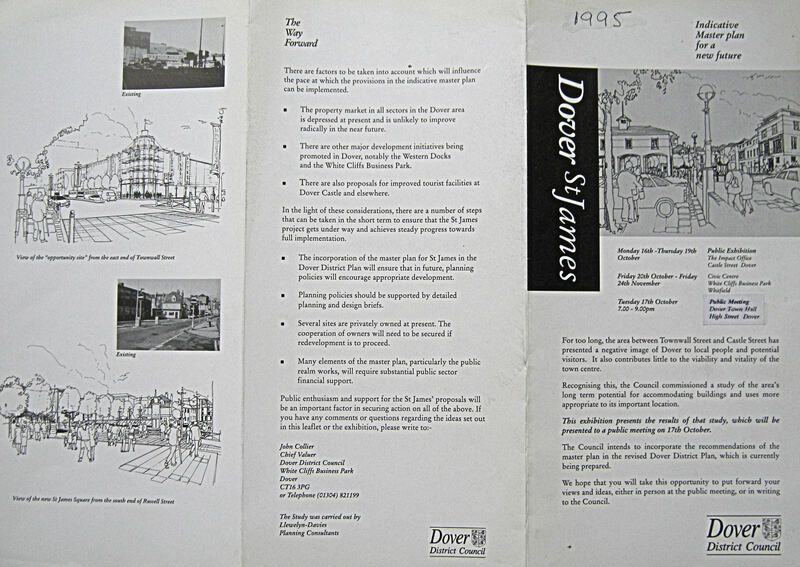 That same year, planning permission was given for the demolition of Burlington House, and Doverhistorian.com felt that it would be an ideal site for a Community Hospital. This was based on the White Paper ‘Our Health, Our Care, Our Say’ and would have included inpatient intermediate beds if it had not been rejected locally. Albeit, the general feeling supported the council’s proposal of an ASDA superstore on the St James Development site, plus 53 flats and a new build hotel. 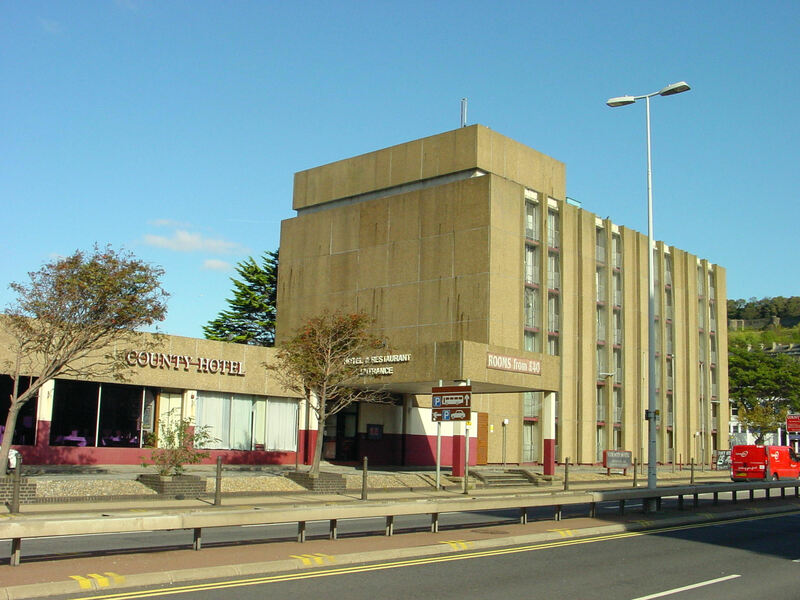 This created a great deal of uncertainty for the proprietors and staff of the County Hotel and in Spring 2014, a Compulsory Purchase Order (CPO) was issued. 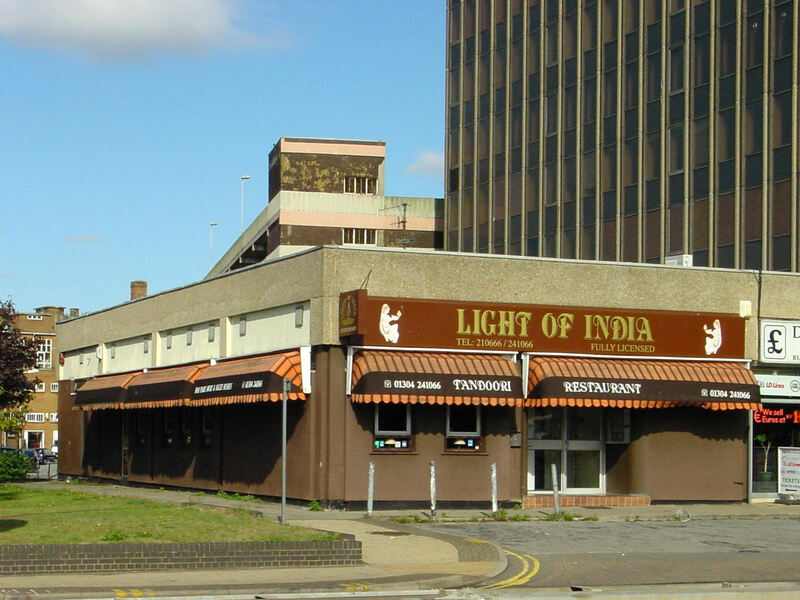 Owners of both residential and existing commercial properties in the area were issued with CPOs including the nationally highly esteemed Light of India restaurant. All were subsequently demolished. Albeit, ASDA, pulled out of the proposal but another retail chain has, apparently, stepped in. Cineworld have agreed to set up a six-screen cinema and Marks & Spencers are proposing down size the Dover store and move from Biggin Street into the redevelopment area. As for Burlington House, it was announced in February 2014 that DDC have applied to the Secretary of State for a CPO to be issued to the land owners on which Burlington House stands. This was ratified on 27 February 2015 by the Communities Secretary Eric Pickles and demolition began. On 11 February 2016, Burlington House was heap of bricks and other building material that eventually was moved to provide in-fill for Dover Harbour Board’s controversial Western Docks project. The Canterbury Archaeological Trust led by Keith Parfitt, undertook the necessary survey of the site before the work began and created a comprehensive report of the historic remains on the site. Work was then started on building the £53million St James complex under the direction of the Senior Construction Manager Greg Adams and the Site Manager, Anthony Bee. This entry was posted in Buildings, Burlington House - A monument to an Arrogant Establishment, Burlington House - A monument to an Arrogant Establishment, Local Government. Bookmark the permalink.